Now more than ever, other cultures are affecting our everyday lives-and our children need to learn about the other countries of the world and their history. Susan Wise Bauer has provided a captivating guide to the history of other lands. 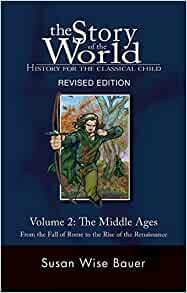 Written in an engaging, straightforward manner, this revised edition of The Story of the World: History for the Classical Child, Volume 2: The Middle Ages weaves world history into a story book format. Who discovered chocolate? What happened to the giant Fovor of the Mighty Blows? Why did the Ottoman Turks drag their war ships across dry land? The Story of the World covers the sweep of human history from ancient times until the present. Africa, China, Europe, the Americas-find out what happened all around the world in long-ago times. Designed as a read-aloud project for parents and children to share together, The Story of the World includes each continent and major people group. Volume 2: The Middle Ages, is the second of a four-volume series and covers the major historical events in the years 400 to 1600 CE, as well as including maps, illustrations, and tales from each culture. 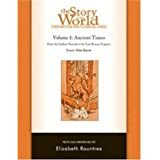 Each Story of the World volume provides a full year of history study when combined with the Activity Book, Audiobook, and Tests-each available separately to accompany each volume of The Story of the World Text Book. Volume 2 Grade Recommendation: Grades 1-6. Start reading The Story of the World on your Kindle in under a minute. This may well be the best multi-age read aloud narrative of world history yet to have been written. Absolutely brilliant cds. The boys (8 and 6) love them and we listen to them in the car all the time. I have learnt so much too! I love this series. The stories and method of telling history as a continuing story helps the kids remember and push the information so that it sticks. The activity books are properly cool with the best activity in the first book being how to mummify a chicken. Properly gruesome and brilliant. My 10 year old son loved this book as he is really into this time in histroy. It makes history very accessable to younger readers. Easy and informative read. Aimed at children but useful as a gap-filler in an adult's historical time-line. Item delivered quick & in excellent order, but content not as expected. If you're looking for artistic examples don't buy this product. Book 1 of this series was very good until the rather rushed last chapter. Book 2 is sadly awful. The author doesn't seem to actually know much about the period of history she has chosen to write on. She has muddled the time line so that she assumes things about characters (Prince Vladimir the Great for example) that simply couldn't have happened - he didn't join the Orthodox Church, as the author asserts, as it didn't actually exist at this point in history. He was baptised Byzantine Catholic. She then makes some strange editorial decisions that leave out huge foundational knowledge - such as the work of the education system and how it effected knowledge, medicine and culture. Then the "stories" are told without the foundational knowledge so the children don't get what happened or why. Her knowledge of English history, especially Henry VIII is laughable. She says how pleased Henry was to hear of Luther! Henry VIII was so voilently anti Lutheran that Ann Boleyn had to hide her religious views from him. She also quite wrongly states that Catherine's marriage to Arthur was "real". I don't know if she has personal access to historical documents that no one else has but the marriage was annulled on Catherine's sworn oath that (as Arthur was very young) the marriage had not been consummated. There are a number of other places where I have had to correct or expand the information for it to make sense. As the author is so astonishingly inaccurate on European history which I do know about I can't trust what she says about other countries which I know a lot less about. This is a shame as the reason I bought Story of the WORLD was because my knowledge of history outside Europe and the America's isn't strong. I would never dream of writing a book on a subject I know so little about- frankly it's dishonest.